Making relationships and sharing Biblical principles with rural villages in a chiefdom requires hours of patient, focused driving with proper care and maintenance of your vehicle. It’s like a very long, wild ride at Busch Gardens! We participated in “Farming God’s Way” in Africa, actually preparing villagers fields for seeding during the rainy season starting next month. Together, the villagers of N’Songwe made “Terrain Ropes” (50 meter strings with bottle caps spaced 60 cm apart) to lay out perfectly spaced planting stations [photo Jack]for maize and rows of groundnuts or vegetables. No teams of oxen or tractors needed! Grab a hoe [photo Bev] and dig 15 cm deep. Using the natural resources available, village farmers add nutrients to the soil with wood ash and manure. After sowing their seeds with the first rains, they will cover everything with “God’s Blanket” – field grasses to protect the young plants from scorching sun and discourage weeds. We used Biblical principles to encourage these farmers to break the cycle of poverty, and care for the Zambian soil God has given them. Camping 5 days beside different villages in the chiefdom of Musokotwani, we trained with Overland Missionaries in Evangelism and Discipleship. We spent cool, windy evenings showing parts of “The Bible” series or “The Jesus Film” with a generator and bed sheet [see photo]. Days were spent visiting sick families, the blessing of a newborn baby, preaching at a local church, and sharing Bible Studies under shade trees with afternoon temperatures between 100°-115°. We learned simpler ways to cook, yet stay healthy. A local pastor directed us to a new village, unknown by the missionaries. Sharing the story and love of Jesus with these villagers was a privilege that outweighed our personal discomforts of heat, lack of cool water, and rough terrain. 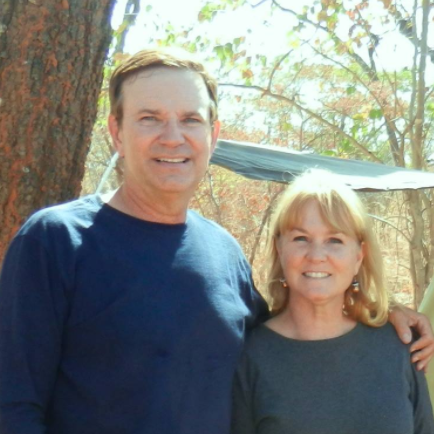 With survey maps of the southern province of Zambia in hand, Overland Missions has confirmed our placement to the farm town of Choma and a 5 year plan of ministry to a large chiefdom called Siachitema. So…“Over the river and through the fields, to 300 villages we go. Next spring it’s our turn to share God’s Word as we obey His call to “GO”! Posted on October 7, 2013 by fullersmission. This entry was posted in Afica, Blog Posts, Newsletters and tagged adventure, africa, Almighty, Healing, human-rights, learning, Music, religion, School, Trip, Water. Bookmark the permalink.